Disney is making it possible to turn every aspect of your material existence into a Tron-style gamescape. 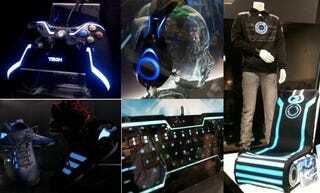 Behold Tron caps, chair, light-up sweatshirts, wiis controls, iphone light disc holders, Playstations and sneakers! Disney Consumer Products rolled out the many merchandising angles they would be slapping Tron Legacy on - from baseball hats right on down to iPhone holders. It's bananas, but these sneaks, these are very, very cool. Check out what we uncovered inside Flynn's Arcade in the heart of San Diego's Comic Con. And here are some images inside Flynn's Arcade so you can get a taste of what it was like both in and out of the "real world."